The last time Boston College field hockey squared off against Syracuse, the game was all but over, 25 minutes into the first half. Led by Elaine Carey, the Orange scored four first-period goals, en route to a 6-0 shutout victory in the Eagles’ 2017 ACC opener. Friday’s match couldn’t have been more different. The game was in question all night, even venturing into double overtime. Ultimately, though, the Orange came out on top, snapping BC’s four-game win streak with a thrilling 2-1 victory. The matchup was destined to be a defensive matchup, with both teams having legitimate stars in their respective nets: Sarah Dwyer for No. 8 BC (7-4, 2-2 Atlantic Coast) and Borg van der Welde for the No. 13 Orange (7-4, 1-3). Prior to the game, Dwyer sat fourth in the country allowing only 0.97 goals per game, while van der Welde averaged 4.7 saves per game, second best in the ACC. The game lived up to the hype with Syracuse outlasting the Eagles by a score of 2-1 in a double overtime classic. While the loss is undoubtedly a setback for BC, the result could also be seen as an improvement, considering the team was trounced by the Orange last year by a score of 6-0. The Eagles cannot seem to get past Syracuse, a program that hasn’t dropped a game to BC since 2014. Friday’s game was about as close as it could possibly get, and the first half certainly reflected that. The Eagles had controlled time of possession and managed to get off more shots in the first half, outshooting Syracuse by a total of 6-2. While it had some decent opportunities, BC was simply unable to challenge van der Welde, with only two of the six shots forcing a save. The Syracuse defense didn’t have to get in front of the shots either, with three of them going wide and the last one being blocked before it could reach the net. BC mustered one penalty corner about 10 minutes into the half, which resulted in a blocked shot by Frederique Haverals, but the Orange escape unscathed. The rest of the period went by rather uneventfully, with the score at the break tied at 0-0. The second half saw the action pick up considerably, as both teams upped the ante prior to the overtime periods. Whereas the Eagles had the offensive advantage in the first half, the Orange came out with a better gameplan in the second. Syracuse led the shot tally for the second half, 8-5. Four of the Orange’s eight shots required Sarah Dwyer to make tremendous saves. Without the great play of the junior netminder, the Eagles would certainly not have lasted until overtime. The Orange struck first, scoring 15 minutes into the second half. Sophomore midfielder Claire Cooke managed to find the back of the net for her first goal of the season off of a great assist from Kira Wimbert. BC tried to respond quickly, running a great counterattack towards Syracuse’s goal, but, unfortunately for the Eagles, the shot was sent wide by Carly Kauffman. Still, Kauffman’s attempt brought the Eagles to life, as they rattled off three-consecutive corners. The first saw a shot from Lucy Lytle blocked and the second didn’t result in a shot attempt, but the third found the back of the net, equalizing the match at one goal apiece. Directly off a corner pass from Cassidy Atchison, Haverhals redeemed herself by sliding a shot past van der Welde, tying the game for the Eagles. To its credit, Syracuse responded, totalling three corners and four shots, but the Eagles defense stood strong, blocking three shots—the fourth was saved by Dwyer. 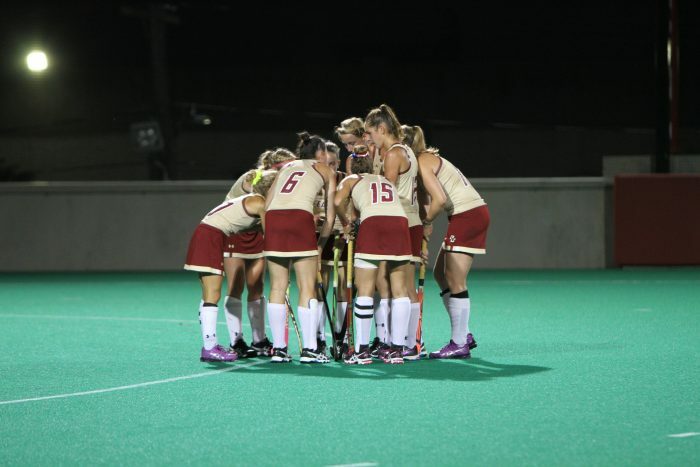 BC dominated the first overtime period, recording four shots without allowing one on its own goal. Two great corner chances were squandered by the Eagles’ offense in the final five minutes of the first overtime period. A particularly promising Ymke Rose Gote shot was blocked with only two minutes left to play. BC was unable to break through, however, and a second overtime was required to settle a victor. The final frame was rather abbreviated, as Syracuse star forward Roos Weers tallied her sixth goal of the season, just three minutes into the period. The game-winning score came off of a corner assist from Kira Wimbert, her second of the night. The victory will give Syracuse a vote of confidence heading into a non-conference matchup against California on Sunday. The Eagles, on the other hand, have to be frustrated with themselves—they had several chances to win the game in the first overtime period, but failed to convert. While credit must be given to the Orange defense and van der Welde, BC surely feels that it could’ve, and probably should’ve, logged its third conference victory on Friday night.